The Memorial Day weekend officially kicks off the Summer travel season; our car is loaded up and we’re ready to go! We are headed to Ohio for some fun in and along the Lake Erie coastline, our first destination: Put-In-Bay. 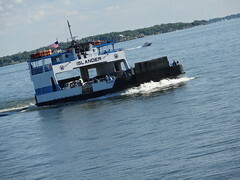 As we approach the Miller Ferry in Catawba, we’re pleased to find plenty of room on board, hooray! We park in a local lot, purchase 2 round-trip tickets and board the vessel. It’s a gorgeous day to be out on the water, the only drawback being the cold breeze off the still-chilled lake. Covered in sunscreen and bundled in sweatshirts, the 18 minute trip is over before we know it. Still early on the first Friday of the season, the island seems to be just waking up when we arrive. 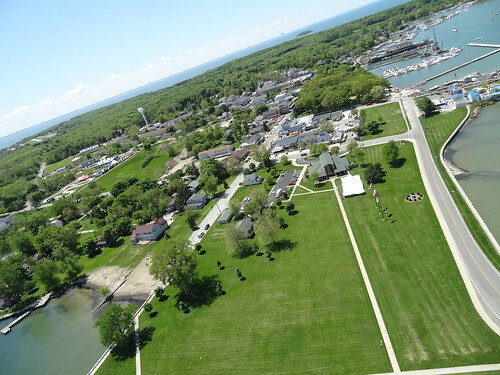 The Victorian village of Put-In-Bay (PIB) is located on South Bass Island in Lake Erie; the name originally referred to the bay itself, schooners sailing on the lake would “put in” to this bay to wait out bad weather. 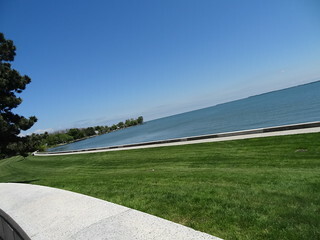 PIB has been a tourist destination since 1864, it is one of Lake Erie’s most popular resort areas. The island itself is 3.7 miles long and 1.5 miles wide; according to the 2010 Census it is home to 138 people. Let’s see what this place is all about. On the island we are immediately greeted by lots offering us rental of golf carts, bicycles and scooters by the hour; we are two miles from downtown and there’s a strong wind, we go for the golf cart….Carts like these are the most common form of transportation on the island–they are everywhere! I sign the lease agreement, am given a yellow copy and a map of the island, Kris takes his place behind the wheel of our newly rented transportation and we’re off…. We are both excited to visit Perry’s Victory and International Peace Memorial, last time we were here, the line to go up to the observation deck stretched out the door. 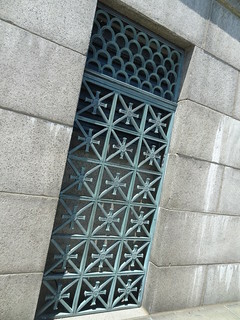 The only international peace memorial in the National Park System, it was built by a commission of nine states and the federal government from 1912 to 1915. 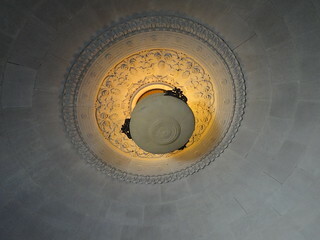 The remains of three British and three American officers killed during the Battle of Lake Erie lie under its rotunda. 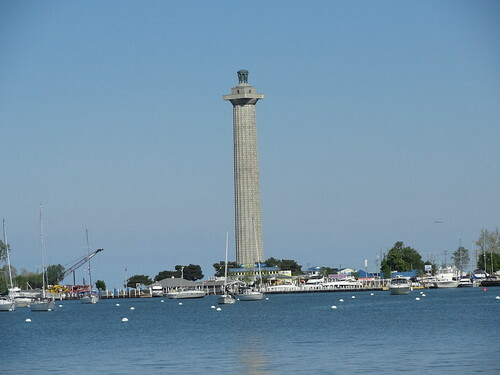 The memorial commemorates that battle in which Commodore Oliver Hazard Perry led a fleet to victory in one of the most significant naval battles to take place in the War of 1812; it is from this battle Perry coined the phrase: “Don’t give up the ship”. We follow Langram Dr until the memorial comes into view, the 352 ft monument is the world’s most massive Doric column; it is among the tallest monuments in the US and quite a sight. 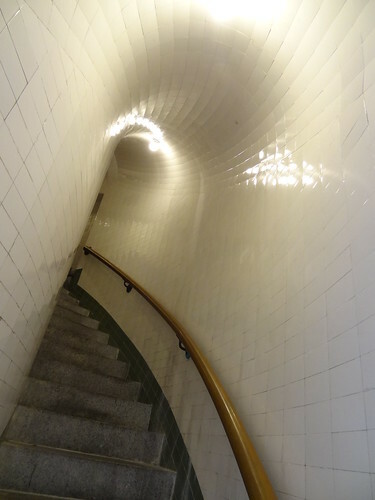 Inside, we climb the narrow, curving stairway to the elevator, a ticket to the top costs us $3 each. The ride to the top goes quickly, we exit the elevator and walk out onto the observation deck with its stunning panoramic view, wow! 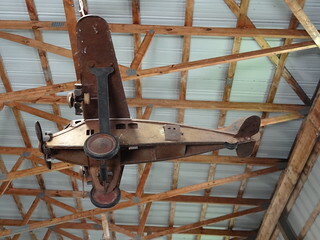 From here we have a bird’s-eye view of our surroundings; the lake, islands, city, even Canada. The sky is Robin’s egg blue, low clouds hover on the horizon, the water is cerulean, everything else is a vibrant green; indeed, nature has sprung to life after a long, harsh winter, it is quite spectacular. 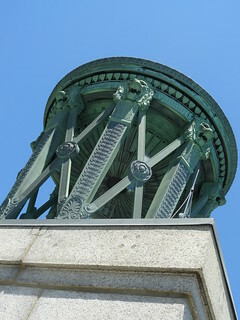 The structure is made up of limestone blocks, ornate grates appear here and there, an 11 ton bronze urn tops the granite column. 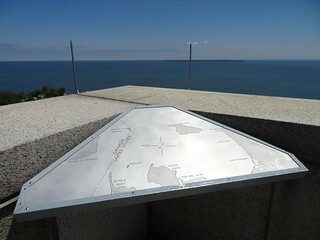 Maps are placed on each of 4 sides identifying what we see in the distance; Kelley’s Island, Pelee Island, mainland Ohio, Sandusky Bay, Marblehead and Lakeside. Roads are laid out clearly, docks jut out into the bay, marinas wait patiently for the boats to arrive; in the distance it appears sky and water meet. It’s hard to leave such incredible scenery, but we have lots of island left to see. 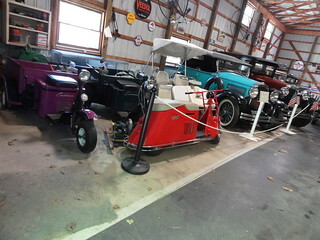 We cart on over to Perry’s Cave at the Family Fun Center; I go inside to buy tickets, when I come out I find Kris at the Antique Car Museum. 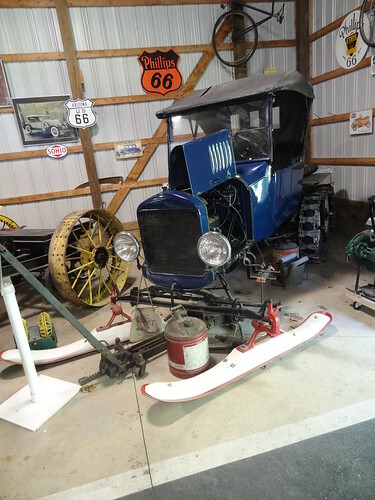 It seems Skip Duggan, lifelong resident of PIB, had quite a passion for antique cars; favoring Ford Model T’s and A’s, his personal collection is on display for all to enjoy. 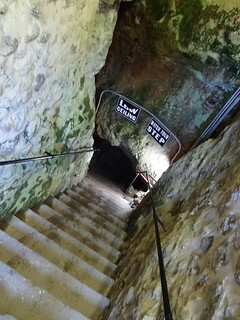 When it’s tour time, our guide, a native of PIB, leads us down the 44 steps into the 208 ft long, 165 ft wide Perry’s Cave, which is a stable, but chilly, 50 degrees. This is a natural limestone cave discovered by Commodore Perry in 1813, they say he and his men slept here during the war. Calcium carbonate covers the ceiling, floor and walls; it is very wet down here today, puddles have formed on the floor, cold water drips on us from above. 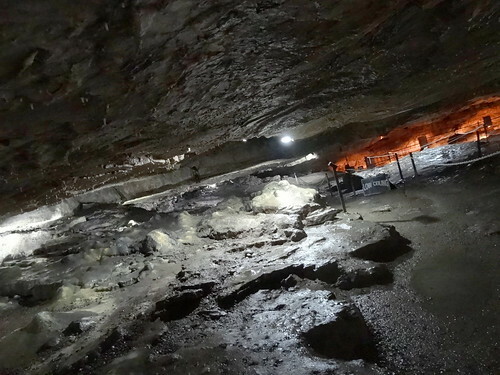 We follow our guide along the pathway through the cave, hundreds of straw-like stalactites cling to the ceiling as stalagmites are forming on the ground. 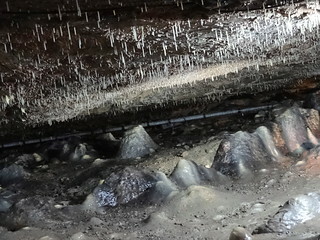 The ceiling is very low, some of our fellow tourists have to bend nearly in half in certain areas, the floor is slippery too. 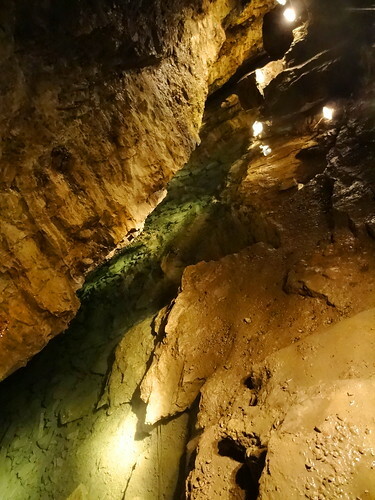 Our guide shines her light into a pool of water and tells us this is a lake, the water takes on a greenish tone from pennies that have been tossed in on wishes throughout the decades. After looking at the lake we turn around and re-trace our steps, all in all enjoyable…in a tourist-trap kinda’ way. On the way to the cave we passed a restaurant with an inviting looking patio, that’s where we’re going now to have lunch. Goat Soup and Whiskey Tavern is a fair distance from the hustle and bustle of downtown, this charming building resides between the church and Heineman’s Winery on Catabwa Ave. Kris parks the golf cart once again, it is #209, important to remember when so many carts look exactly alike. The interior feels old and quaint, turns out this was originally a winery. 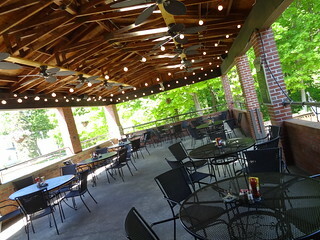 Round lights are strung from the ceiling of the covered patio, nobody is eating out here this afternoon; a crisp breeze blows and now I know why, we will have to settle for the indoors today. 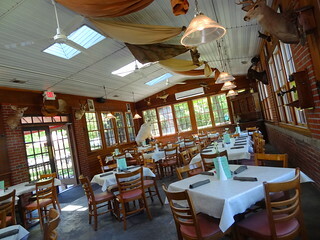 We are seated in a lovely room, sunlight brightens the space through skylights and windows, walls are brick with wood trim, a variety of animal heads are mounted on the walls. We start with a cup of beer cheese soup, it is creamy and delicious. 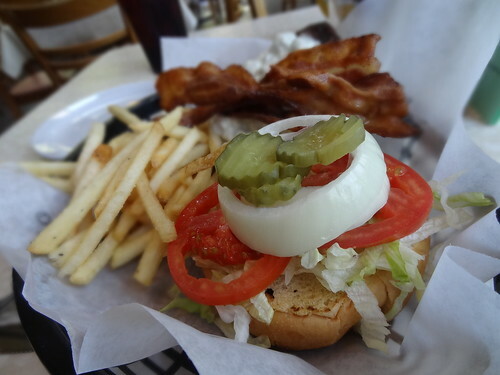 Next up, the blue cheese and bacon burger arrives, the bacon is crispy, the burger cooked just the way we like it, cut in half and served with fries it is enough for two. All of the soups and sauces and made from scratch, vegetables and herbs come from their garden, bread is baked in house and desserts are homemade, yum! Too full for a real dessert, you know what they say, there’s always room for chocolate….. oh,maybe it’s just me who says that…. 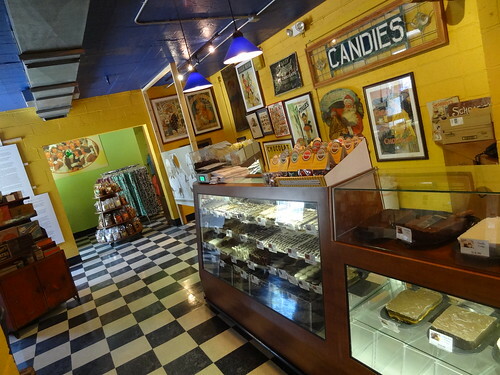 The lower level of the building is home to a chocolate museum and candy shop. The variety is huge; fudge, truffles, barks, creams, they have nuts, fruits and malted milk balls all dunked in rich chocolate goodness. Kris and I each manage to choose a few pieces, a cup of hot coffee for me and we are back in the cart exploring…but more on that later.